Jane Walker came to SMCCNS as director after serving at the church as a Sunday School teacher for over fourteen years. Jane has an extensive background in education and Early Childhood Education advocacy as a Bilingual Kindergarten Teacher and Early Childhood Educator in the Greater Los Angeles area. Jane earned her BA in Spanish and Political Science from the University of Redlands, and after her first child was born, took time off to continue her education and raise her three boys in Arcadia. When her eldest was two years old, she landed at a cooperative preschool where she was mentored by a wonderful director and expert teachers—a role that prepared her to take the reins at SMCCNS as Director in 2013. 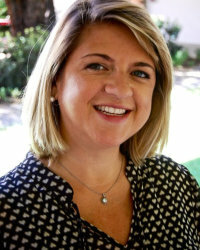 Jane serves as a Past President and Advisor to the California Council of Parent Participation Nursery Schools and has completed her Advanced Administrative Early Childhood Credential at UCLA. Jane is a partner with families and values the teachers at SMCCNS as true professionals and researchers in partnership with children—learning and growing together. Do you want to talk to our staff? Call 626-282-4186 for assistance.